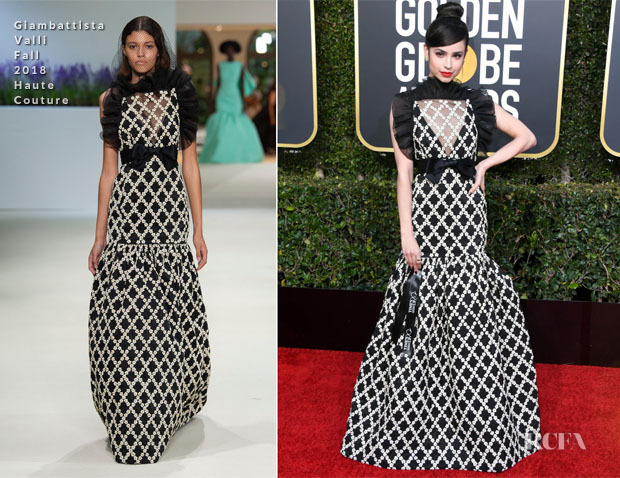 Sofia Carson stepped out at the 2019 Golden Globes on Sunday (January 6), joining Regina King and Laura Harrier. The singer-actress brought the drama in a Giambattista Valli Fall 2018 Haute Couture dress. She is fond of a princess moment, but many likely wouldn’t have anticipated this graphic black-and-white direction with ruffled neckline. I appreciate a fresh silhouette, but am struggling with the sharp angles of the frill because they are slightly overwhelming. If we could see more of the open back, it would have been less suffocating.